Scientists have grown a miniature brain in a dish that linked up to a mouse’s spinal cord and surrounding muscles – an advance that promises to accelerate the study of injury or degeneration of axon tracts, such as spinal cord injury. Scientists at the Medical Research Council’s Laboratory of Molecular Biology in Cambridge have created one of the sophisticated ‘organoids’ ever grown in the lab. All from human stem cells – basic cells that can become almost any type of cell in the body. 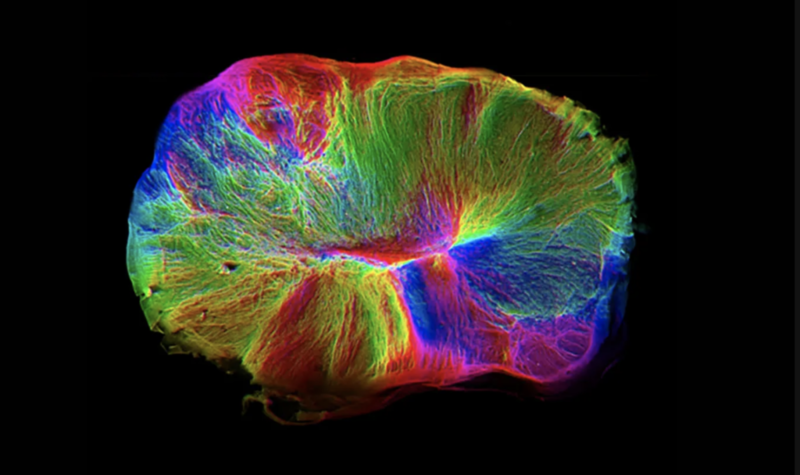 This is the first time an organoid developed enough awareness to reach out and connect itself spinal cord cells. And astoundingly, it made muscle tissue twitch. “We like to think of them as mini-brains on the move,” Madeline Lancaster of Cambridge University – who led the experiment with the Medical Research Council’s Laboratory of Molecular Biology and published the results in Nature: Neuroscience – told the Guardian. While the researchers say it’s “too small and primitive to have anything approaching thoughts, feelings or consciousness,” the researchers say the organoid is made of couple million neurons – approaching the complexity of the brain of a 12-16 week-old human fetus. The size of an organoid has been previously limited by the ability to access nutrient and oxygen supply and once it matured past a certain critical phase, the centre starved. Each organoid was sliced into half a millimetre-thick slices and attached to a membrane that was then placed in nutrient-rich liquid. This allowed the central neurons of each ALI-CO (for “air-liquid interface cerebral organoid”) to continue receiving nutrients from below and oxygen from the air above, allowing it survive and continue produce new, healthy cells for over a year. After placing a tiny one millimetre-long piece of spinal cord and back muscle from a mouse next to the germinating mini-brain, the researchers watched as it sent out neural ‘tendrils’ to intertwine with the spine, eventually sending out electrical impulses and causing the mouse muscle to twitch. Live imaging of the ALI-COs’ slice cultures revealed that axons, the nerve fibres that connect neurons, produced healthy outgrowths “reminiscent of nerve tracts”. “With our enthusiasm for getting emerging treatments to the people who need them as soon as possible, it’s easy to forget just how much we don’t know about spinal cord neurogenesis,” said SpinalCure Australia’s CEO Duncan Wallace. It’s great to see such a fascinating advance, not only for our understanding of spinal cord injury but also for brain injury and other neurodegenerative conditions,” added Mr Wallace.